Routine pruning improves the health of trees, restores shape, and prolongs their life. The removal of weakened, dead, diseased or insect-infected branches that might snap off during heavy winds is beneficial in preventing storm damage. 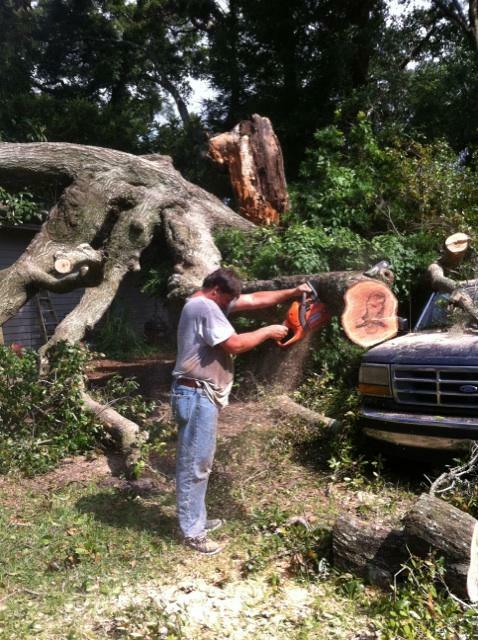 Pruning reduces the chance of breaking limbs by allowing the wind to blow through your tree and not into it. A common practice called "topping" is used to reduce the height of trees around utility lines and homes. Topping is not the same method as crown or height reduction and is the most serious wound you can inflict upon a tree. It drastically shortens the life of a tree by exposing the remaining bark to direct sunlight, which can permanently damage or even kill the tree. It removes the tree's main leader and branches, resulting in stubs and disfigured new growth. The initial large wounds never heal properly and subsequent growth is very weak. •Crown cleaning provides selective removal of dead, dying, diseased or weak branches. •Crown thinning is the selective removal of healthy, live branches to increase light penetration, air movement and reduce weight. •Crown raising consists of the removal of lower tree branches for clearance. •Crown reduction is the removal of live or dead branches to reduce the trees height or spread and the risk of storm damage. •Dead wooding is the removal of the tree's deadwood to improve safety and aesthetics. It is also disease prevention since deadwood offers a prime entry point for pathogens like bacteria and fungi.